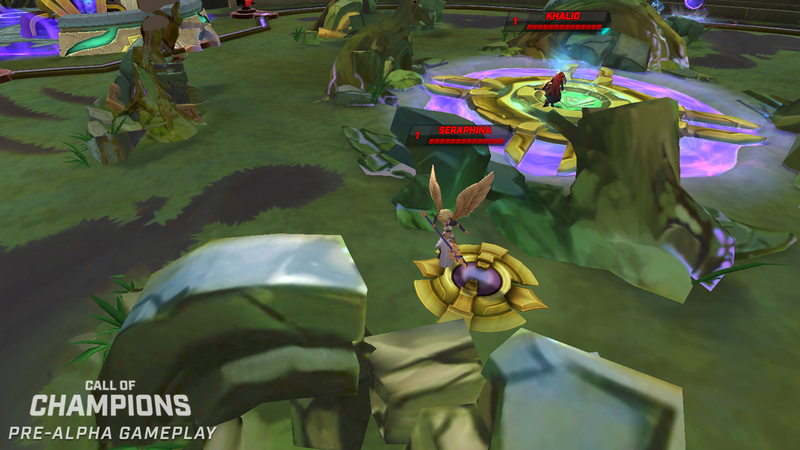 The MOBA genre is one that has been proven to work on a physical level on iOS – Fates Forever (Free) and Vainglory (Free) are both tons of fun. But they both require long gameplay sessions that might not be conducive to many people’s lifestyles and expectations for mobile games. That’s where Spacetime Studios, creators of several mobile MMOs including their latest, Arcane Legends (Free), are coming in. They’ve just announced their game, Call of Champions, which is a 3-versus-3 MOBA with 5-minute game sessions. The idea for the game is that it will try to distill down MOBA mechanics into bite-size portions. There are no item shops, no minions, nor jungles. You start off with all your powers, though you can pick up powerups. You’ll fight other players online in real-time with support for cross-platform multiplayer, and Spacetime’s promising around 20 characters at launch with up to 40 down the road. And there will be no pay-to-win mechanics, you’ll just be able to speed up the unlocking of other characters. While other games have tried this sort of speed MOBA strategy, notably Solstice Arena (Free), it’ll be interesting to see what Spacetime does. They have a track record of success with adapting big PC genres down to mobile with their MMOs. MOBAs are such big business that one game has got to finally break through and become a smash hit on mobile. We’ll be seeing this game next week at GDC and be going hands-on with it.